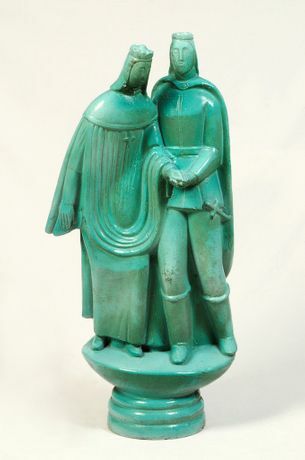 Arturo Martini, Lo Sposalizio del Principe, 1926-27, hand-painted majolica, cm 94x49x24 - b.r. This exhibition reveals forty unseen artworks by Arturo Martini (Treviso, 1889-1947) from the prestigious art collection of Constantino Barile (Albisola 1886 – 1968 a studious historian and lawyer) who knew the artist personally. Arturo Martini was born in Treviso 1889, he was the most important Italian sculptor of the first half of the 20th century. Preceding the likes of Lucio Fontana, Arturo Martini’s sculptural creations present an engagement with the historical traditions from the region of Liguria, and an attempt to renew the Ligurian artistic language. The exhibition offers a rare opportunity to view a myriad of terracotta ceramics by Arturo Martini of excellent provenance, which Constantino Barile displayed in his private home alongside traditional blue pottery from the region of Liguria. The works displayed in this exhibition depict the artist’s creative imagination during the 1920s, Martini’s large sculptures in plaster are both daring and delicate, executed with great agility showing the marks of a storyteller who tested the limits and possibilities of ceramic making. As a creative narrator, Martini worked outside any rigid system of order, he was an experimental artist stimulated by the tactile and colorful potential of clay, an inventor of the unknown. 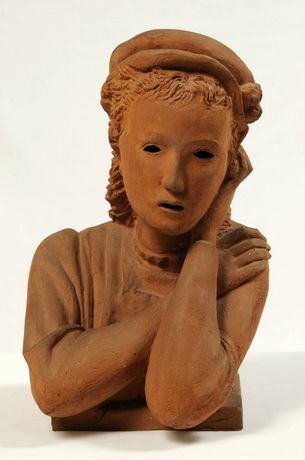 During his adolescent years, Martini worked as an artisan in his hometown Treviso, where he learnt technical skills that would later serve him in ceramic making. The young and curious Martini was ardent to discover the art and design outside on exhibit in Paris in the great Art Déco (Decorative Arts) exhibition of 1925. The works presented in this exhibition are some of the artist’s most influential works, in particular the famous portrait of his daughter Maria entitled La Nena, whom he captured and portrayed during the moment she left home. 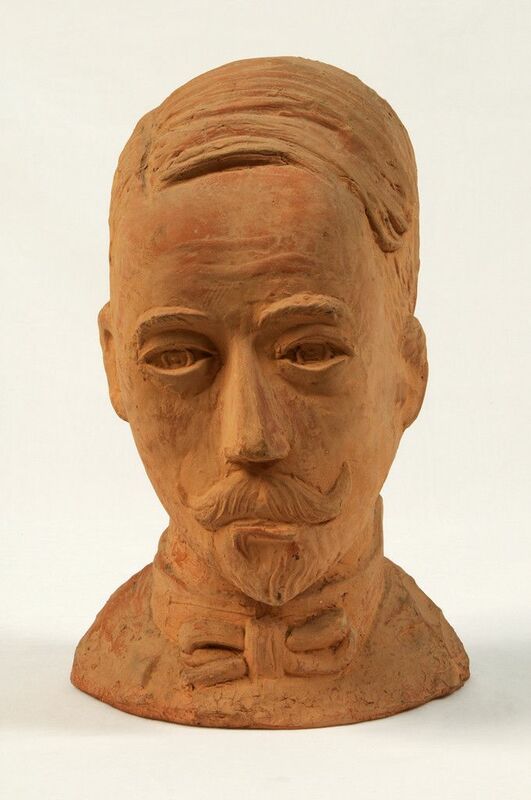 Another poignant work on display is the portrait of his uncle entitled Zio, whom he portrayed in an almost metaphysical style as a sort of mannequin, recalling his close acquaintance with the De Chirico brothers. Bagnante is also a key work in the collection as it displays the artist’s technical skill of hatching. Martini’s ceramics are inspired by sacred divinity, they are beautiful and mythical works which retrace familiar chapters in history, such as the nativity scene. Martini conceived this scene in both a small-scale version and a large-scale version, and although they are different, they are also complementary as one is vertical and the other is horizontal. The vertical work is a pictorial depiction, and the latter is a sculpture made from plaster, entitled ‘Saint George and the dragon and the wedding of the prince with the princess’. 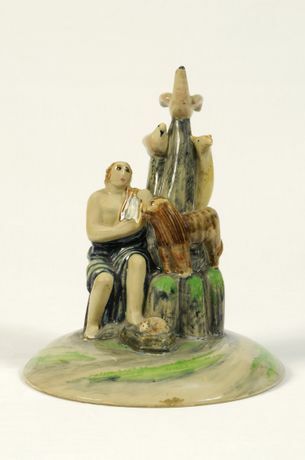 The collection also contains a plethora of the artist’s decorative plates, which depict the ‘History of Saint Orsola’ and the ‘Parable of the Prodigal Son’. The sagacious artist created these unique, figurative narratives, as well as the panels of Via Crucis, in a historical version with an opaque finish distinguishing it from his other famous works. Many of Martini’s early ceramics such as ‘The Golden Cage’, ‘The Salve of the Monster’, or the ‘The Romantic Woman’ were created for Manlio Trucco’s gallery-shop, ‘Fenice’. These creations collectively portray candor fables of irony and romanticism, recalling ancient mythology and familiar biblical themes. Arturo Martini’s ceramics collectively demonstrate the artist’s commitment and research of ceramic making. The sculptures, plates, still life’s and even the reliefs are like scenes of a theater, resulting in astonishing artworks.